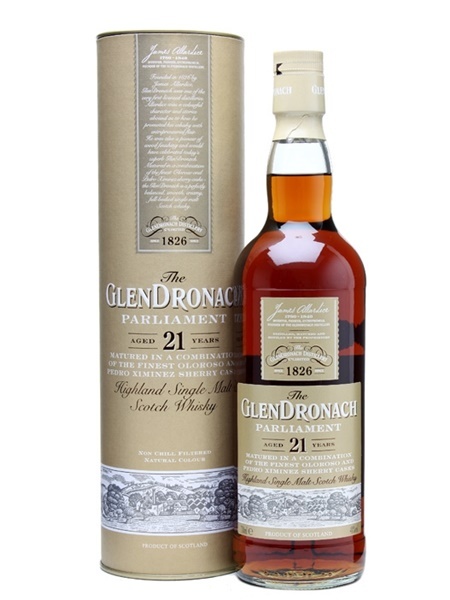 The GlenDronach distillery is one of Scotlands oldest distilleries, steeped in tradition. It was one of the last distilleries in Scotland to convert it's stills from coal fired to internal steam coils. It also performed its own floor maltings until 1996. Since the 1960s, when the distillery was acquired by Teachers, the distillery has had many owners. A deep tradition of sherry maturation changed with the introduction of ex-bourbon maturation. In 2008, a small consortium took ownership and some of that tradition was rekindled and a 12yo, 15yo and 18yo became part of their core range. The Parliament (~€110), named after the colony of rooks overlooking the distillery, is an exclusively sherry matured whiskey, aged in a combination of Oloroso and Pedro Ximenez casks for a minimum of 21 years. It's non-chill filtered, natural colour and bottled at 48% ABV.